Vakker 2 seng 2bathroomapt 20 meter fra stranden UK TV Sky Spts / Movies. We had a brilliant stay in Clint’s lovely apartment right in the centre of La Mata just 2 minutes from the amazing beach. Clint is always on hand if you need anything, fortunately we had no complaints the apartment was very clean and comfortable with everything you need, we cannot wait to return. 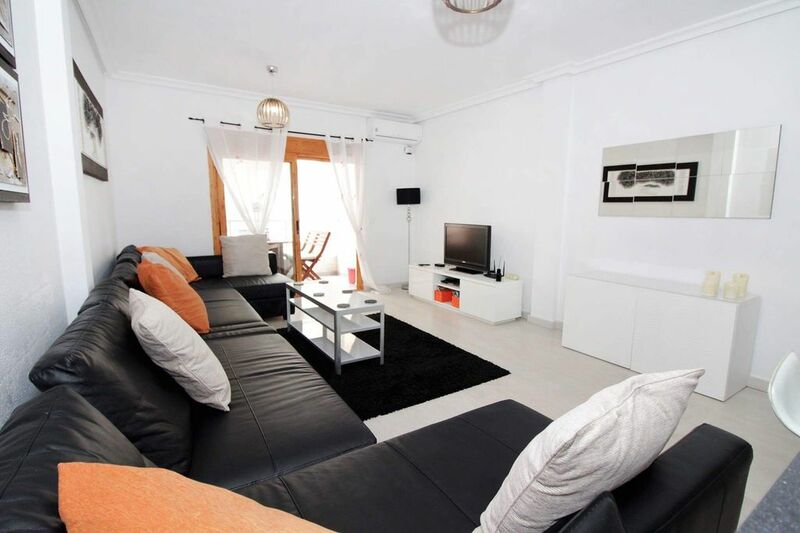 Modern apartment in an older building located just 20 meters from a beautiful beach and close to numerous bars and restaurants. La Mata was very safe with lots to do and only a short cheap bus ride into busier Torrevieja. Enjoyed our stay here amongst Spanish and other holiday makers. Location is wonderful, near the beach. Newly decorated apartment, clean and well-equiped. Thanks Clinton for your kindness. You were always ready to help us. The location of the apartment is wonderful, near the beach. Newly decorated apartment, clean and well-equiped.We've really enjoyed our stay. (It hasn't got parking but we could park our own car in the street not too far). Gracias Clinton por tu amabilidad. Siempre dispuesto a ayudarnos en cualquier necesidad. La localizacion del apartamento es estupenda, edificio situado en segundo bloque de la playa.Apartamento renovado recientemente, limpio y muy bien equipado. Nuestra estancia ha sido maravillosa. (Una pega, no tiene parking, aunque en nuestro caso pudimos aparcar no demasiado lejos). I would definitely reccomend this apartment thank you Clint very much. We didn't feel the need to hire a car as there is a good bus service close by. Definitely NOT as described in the advert....dirty, lacking in security, in a state of disrepair! Stayed one night, which was spent sitting up waiting to be broken into as no locks on sliding doors or window. Window in bedroom opened onto someone else’s patio! Dirty....kitchen units greasy, used food left in fridge, pubic hair on bedroom floor, filthy rusty bathroom. Would not recommend. Views from balcony were supposedly of the sea it was a brick facia not sea.